For the first nosing, the alcohol stands out immediately, then roasted aromas and freshly sawn oak boards mix. Voluminous sweetness develops, caramelized sugar and hints of popcorn disappear in dark fruit flavors. 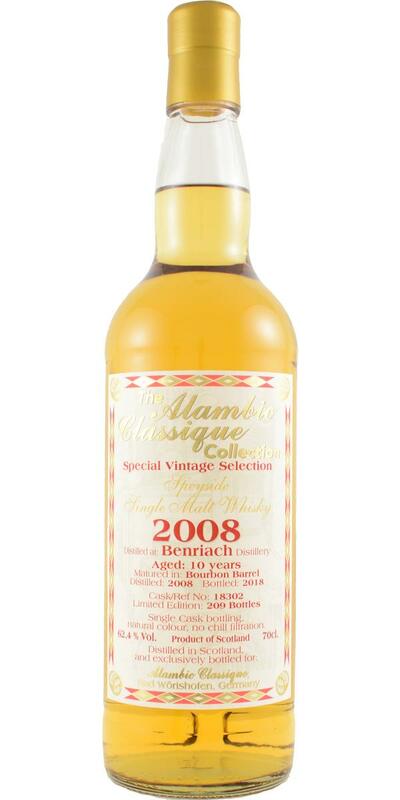 Old and slightly sour apples and dark vanilla rise, tropical fruits follow the intensifying apple note. Creamy caramel drips on roasted almond, the sweet sugar and honey note is pervaded with fresh mint. Spicy oak tones break through the sweet tart fruit note, the alcohol is now harmoniously integrated. Again and again sawdust and the smell of freshly sawn wood, the tart apple note slowly moves back into the foreground. At the beginning of the first sip, intense wood tones mix with sour apple slices, then mercilessly wooden sharpness lays over the tongue. Colorful peppercorns burst on the tongue and exude in combination with the intense oak acerbity a harsh and pungent basic flavor. Slowly, the alcohol and the sharpness fade away, leaving spicy oak notes and dark fruity notes. The second sip flows just as sharply and spicy over the tongue, warm heat warms the palate and especially the tongue. Over time, the wood sharpness vanishes while juicy apple pie exudes its slightly tart aroma. A decaying sharpness is still resting on the tongue, the remaining crumbs of the apple cake are reminiscent of tart apples and crumble cake. Dark caramel separates from the crumbs, dry and harsh wood tones end in fresh chewed walnuts. The walnut flavor will be more dominant and creamier, with hints of toffee and caramel. Likewise, the tart and sour baked apple becomes noticeable again. The alcohol is not hiding. Amazingly dominant wood notes. From time to time I have to think of a barreled gin. Citrus notes come along that combine with the sweetness of the wood sugar. Vanilla. In the mouth, the sweetness is now more pronounced. Then green apple drizzled with lemon juice. Also some roasty flavors come. Nothing I would buy. He is not indestructible now, but just not exciting.